Location of the Mapleton megatrench site. 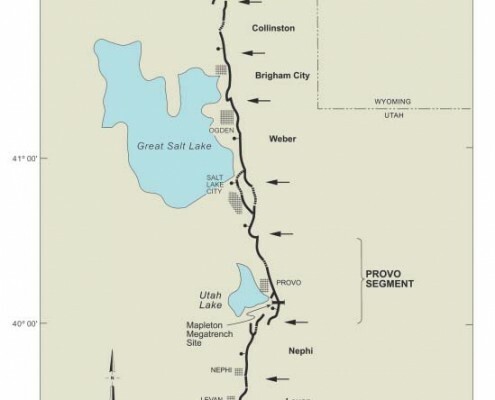 Segments of the Wasatch fault are labeled in bold. This past summer, URS Corporation and the Utah Geological Survey (UGS), with assistance from the University of Utah (U. of U. 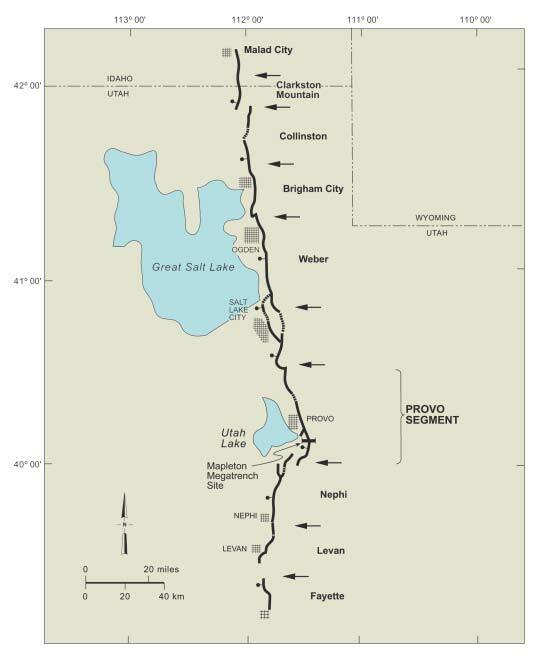 ), embarked on a “megatrench” study of the Provo segment of the Wasatch fault zone). 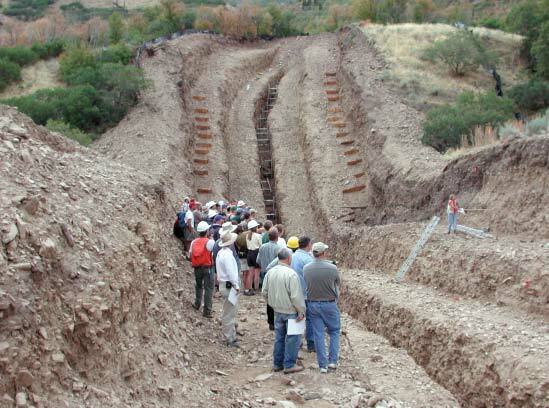 The goal was to dig deeper than any previous trench dug across the fault, with the purpose of exposing evidence for prehistoric earthquakes (paleoseismicity) back in time to more than 11,000 years ago, doubling the length of the paleoseismic record for the Provo segment. Despite extreme logistical challenges, we accomplished our goal through unprecedented cooperation between federal and state government agencies, local universities, and private industry. The study was managed by URS and funded by the UGS and U.S. Geological Survey through the National Earthquake Hazards Reduction Program. Why the need to study older earthquakes? 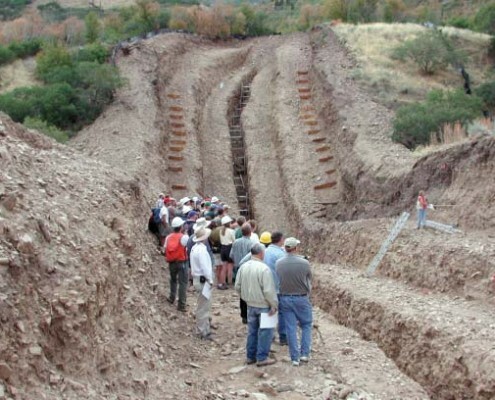 A recent large trench study by James McCalpin of GEO-HAZ Consulting on the adjacent Salt Lake City segment of the Wasatch fault to the north found evidence for considerable variation in rates of earthquake occurrence. Subsequent studies by Ivan Wong and Susan Olig at URS indicate that these rate variations significantly impact probabilistic seismic hazard evaluations, and can either increase estimated ground motions by as much as 60 percent, or decrease them by as much as 20 percent, depending on how rates are used in the analysis. Results from this study will help determine if these same rate variations have also occurred on the Provo segment, and if so, what may have caused them and how we may better incorporate them in future seismic hazard evaluations. The Mapleton megatrench was about 8 miles southeast of Provo, on the southern third of the Provo segment. 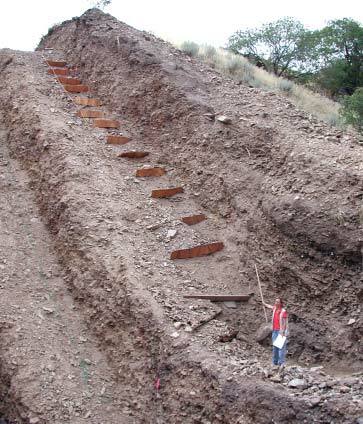 It was excavated across a large main fault scarp and several antithetic faults that form a trough-like graben at the base of the Wasatch Range. Here, the faults offset alluvial-fan deposits from Big Slide Canyon. The fan sediments are mostly debris-flow deposits and contain abundant charcoal that can be radiocarbon dated to determine the timing of earthquake events. The megatrench excavation included a slot trench in the center with two benches flanking both sides. It was over 30 feet deep, 35 to 50 feet wide, and about 275 feet long. 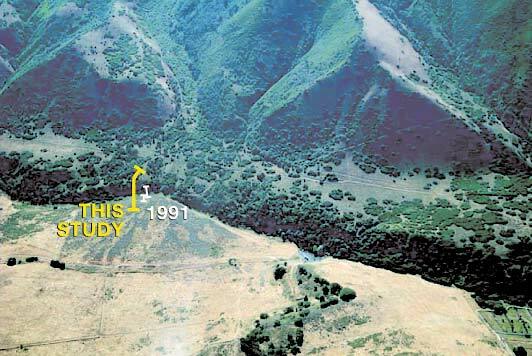 Its size was complicated by the large, steep slope of the main fault scarp, which is over 60 feet high and has an average slope of 35 degrees. In addition to excavating and logging the trench, we dug three shallow soil pits, mapped the surficial geology in detail, and constructed topographic profiles across the fault scarp. To “see” even deeper and decipher even older fault behavior, the U. of U. conducted geophysical experiments to measure seismic velocities of sediments. We also drilled three boreholes that were 110 to 120 feet deep. The drilling and geophysics were funded by the National Science Foundation as part of a broader study of several faults, which is being directed by Ronald Bruhn and Gerard Schuster at the U. of U. Our fieldwork is nearly complete and the excavations are backfilled, but we are still analyzing data and have only preliminary results to report here. For example, we are still drafting final trench logs, and of the 52 charcoal samples that we collected for radiocarbon dating, we have completed only eight age analyses so far. However, the initial results are promising and include some intriguing surprises. In particular, the unusually extensive exposure of the footwall (upthrown side of the fault) revealed a much more complex deformation zone than expected, with a thick sequence of debris-flow deposits offset across four, not just one, significant down-to-the-west faults, identified as FZ1 through FZ4. Although faulting appears to have generally stepped basinward (westward toward the base of the slope) through time, all of the faults show compelling evidence for repeated movement during the Holocene (past 10,000 years). Preliminary stratigraphic correlations suggest that over 10 feet of vertical offset occurred during two separate faulting events on FZ1 sometime between 5,000 and 11,000 years ago. A thick package of unfaulted debris-flow deposits overlies FZ1, indicating that activity on this fault had ceased by 5,000 years ago. In contrast, colluvial-wedge deposits along both FZ2 and FZ3 provide evidence for surface- faulting earthquakes that occurred after 5,000 years ago, each of which may or may not have been contemporaneous with one of the three youngest events on the main fault (FZ4). The trench also exposed evidence for at least two older faulting events on FZ2 that occurred prior to 6,000 years ago. Additional radiocarbon ages will help us determine if these older events were contemporaneous with any of the older events on FZ1. The trench also exposed several antithetic faults (faults that dip in the opposite direction of the main fault) that, together with FZ4, form the main graben and are identified as AFZ1 through AFZ6. Altogether, we found evidence for at least five separate surface faulting events on the graben faults. 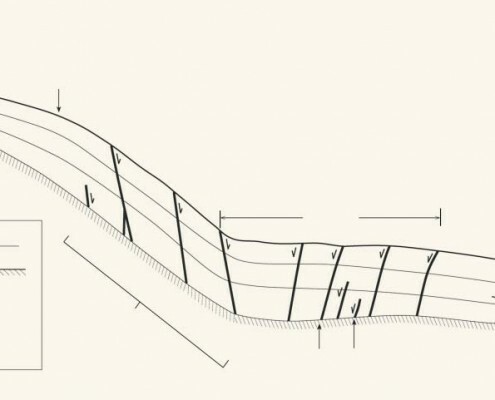 The evidence includes differential offsets of sediments across faults, fault terminations, and faulting- related deposits (e.g., fissure fills and colluvial wedges). One of the more spectacular discoveries was evidence for the youngest event on FZ4, where an apparently very large earthquake created a scarp at least 20 feet high that was subsequently buried by colluvium shed off the scarp, forming a “mega-“ colluvial wedge. Evidence for this event was previously exposed in a shallow trench investigation at this site by Bill Lund of the UGS, who determined that the event occurred about 600 years ago based on radiocarbon analyses. We collected charcoal samples from most of the offset sediments exposed in the graben to constrain the timing of older events, but need to obtain additional funding to analyze these samples. Once additional radiocarbon analyses are complete, we expect to constrain the ages for all the events on the graben faults, and hopefully determine how their timing compares to the timing of events on the footwall faults. Then we can ultimately address our original question as to whether rates of earthquake occurrence have varied significantly on the Provo segment, as observed on the Salt Lake City segment. One striking fact is clear from even our preliminary results: slip rates based on offsets measured from scarp profiles and ages from shallow excavations alone would be much too high due to the pre-existing topography created by much older faulting on FZ1. Without the deep exposures of FZ1, FZ2, and FZ3 in the slot trench, we likely would have assumed that all of the offset we see across the main scarp occurred after 5,000 years ago. This would erroneously yield a slip rate exceeding 4 millimeters/year. Clearly, going deeper in this case paid off, but for unexpected reasons! 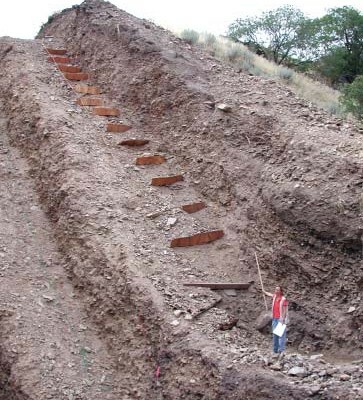 After decades of research by some of the leading paleoseismologists of our time, the Wasatch fault is arguably the best studied normal-slip fault in the world. 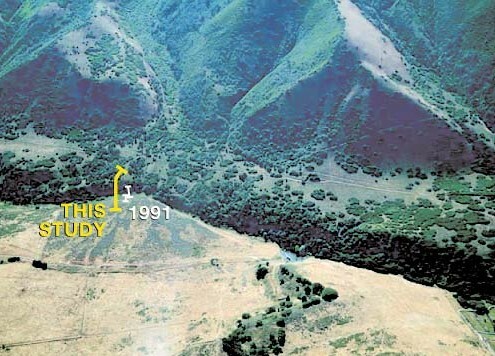 And so it is amazing to us how much we still have to learn about this incredible fault that has fundamentally shaped the Wasatch Front landscape and will continue to do so for generations to come. Acknowledgments: Many have contributed to the Mapleton megatrench study, but we are particularly thankful to: Ronald Bruhn, Maike Buddensiek, Chris Busch, Gary Christenson, Scott Cragen, Mike Hozik, Mike Hylland, Rich Giraud, Justin Johnson, Ann Mattson, Craig Nelson, Eliza Nemser, Gerard Schuster, David Schwartz, Gordon Seitz, David Simon, and Ivan Wong. We also thank the following for their logistical assistance: Bob Gunnell, Joergen Pilz, Don White, Mapleton City, the Suburban Land Reserve, and the Division of Wildlife Resources.